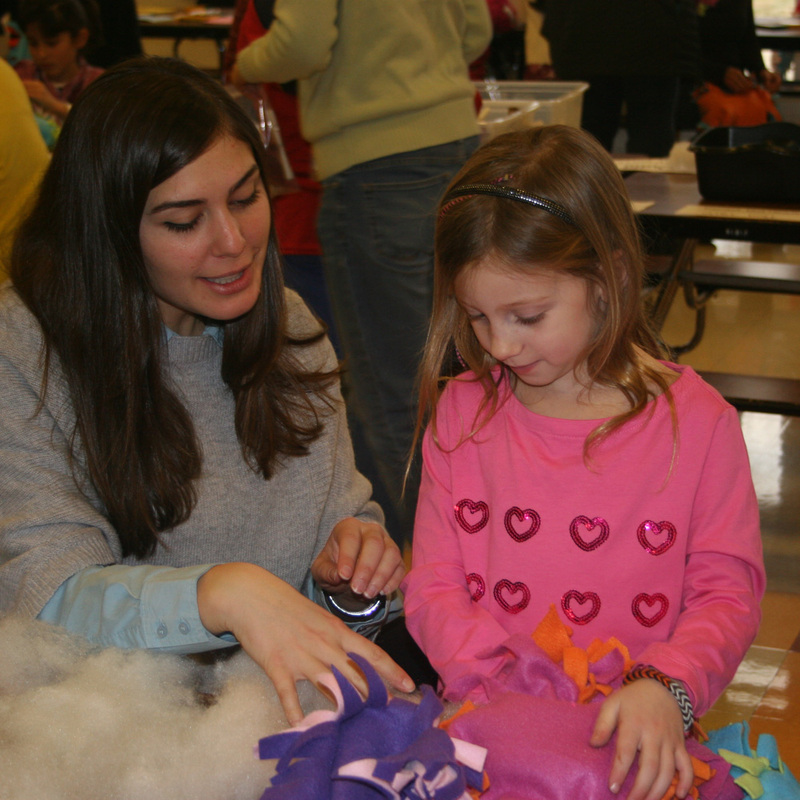 Malina Margolus (left) helps Chadds Ford Elementary Kindergartener Ava Robbins (right) craft a no-sew blanket to be donated to children in need. Once again, the district is honoring Dr. King’s legacy through service. Although schools were officially closed today, Chadds Ford Elementary School was just one of many schools in the district that opened its doors to serve the needs of its neighbors and those in the surrounding community. 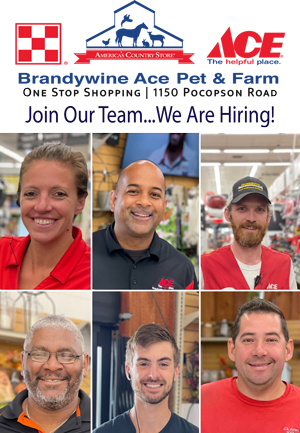 It’s all part of the district’s “Day On, Not a Day Off” initiative to encourage service opportunities during this day of reprieve from academics. The cafeteria at Chadds Ford Elementary School was packed on Monday morning as students made crafts such as ‘no-sew’ fleece blankets, ‘Little Friends from Chadds Ford’ wooden doll kits, and handmade cards, to be donated to hospitalized children and children residing in local shelters. 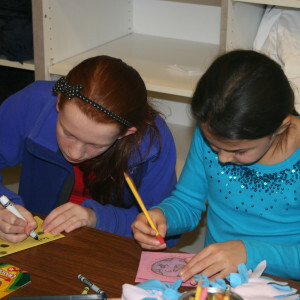 Unionville Elementary students Taryn Blecher (left) and Jessica Hall (right) decorate a card and write words of encouragement for sick children at A.I. duPont Hospital for Children. Ava Robbins, a Kindergartener at Chadds Ford Elementary School, participated in the MLK Day of Service for the first time. She carefully tied fleece ribbons to make a no-sew pillow, just one of hundreds to be donated. Robbins seemed to be enjoying herself as she worked on her craft admiring the orange and purple pillow – two of her favorite colors. Students from other schools in the district also showed up at Chadds Ford to lend a hand. Unionville Elementary School students Taryn Blecher and Jessica Hall made cards with messages of goodwill to accompany the crafts. Both Blecher and Hall are members of Unionville Elementary School’s Stars for Service group which participates in service opportunities throughout the school year. 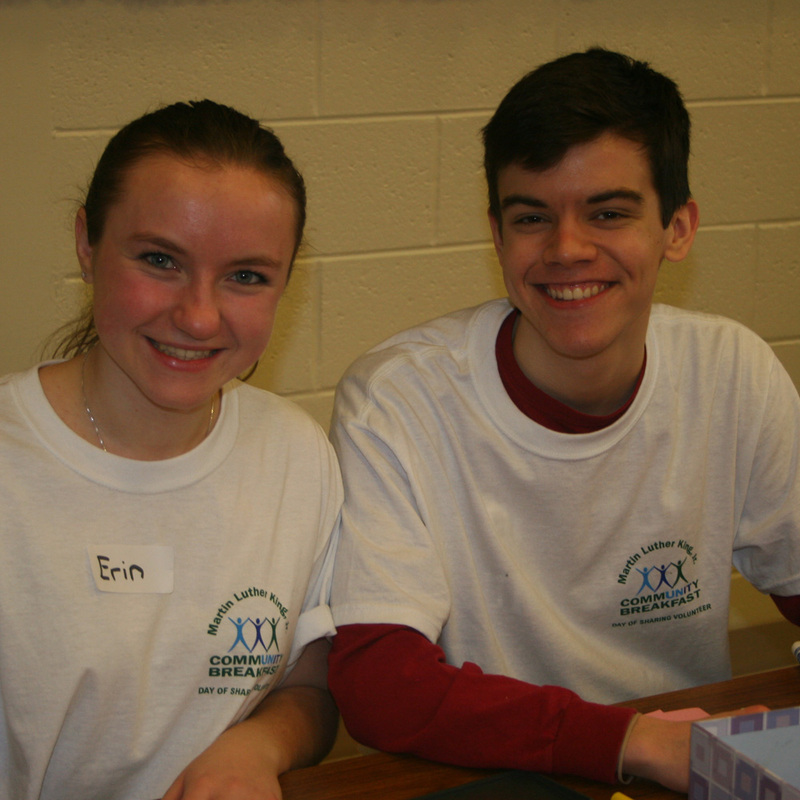 For Unionville High School seniors, Patrick Bova and Erin Kutz, participating in the MLK Day of Service was like coming home. “It’s great to come back to Chadds Ford Elementary where we attended school and see some of our teachers,” says Bova. It was at Chadds Ford where he and Kutz became friends in the second grade. Now, many years later, they’re working together to lend a helping hand. Unionville High School Seniors Patrick Bova and Erin Kutz lend a helping hand at the MLK service initiative at Chadds Ford Elementary School. They were just one of many high school students donating their time on their day off from their studies. “We’ve participated in the MLK Day of Service before and it’s always exciting to see everyone come together and get involved,” adds Bova. For Bova and Kutz, they are helping those in need while also earning service hours for the High School’s National Honor Society Club. Even Chadds Ford Elementary School Principal, Mark Ransford, was participating and working to keep the event organized. “We are happy to open our doors and offer service today,” says Ransford. “We wanted our focus to be kids helping kids,” he adds. Many children will be helped indeed. Approximately 200 fleece pillows will be donated to A.I. DuPont Hospital for Children along with 150 Friends from Chadds Ford doll crafts. An additional 50 pillows and 30 doll crafts will also be given to PathWays PA, a provider of residential and community-based services for women, children and families helping them achieve economic independence and family well-being. And, a dozen pillows and doll crafts will be donated to Mom’s House, an organization dedicated to supporting low-income, single mothers. Other schools in the district joined in with service opportunities of their own. A soup kitchen was set up at Hillendale Elementary School along with a bag lunch preparation. Fleece blankets and handmade bookmarks were made at Pocopson Elementary School while middle and high school service initiatives benefitted Pocopson Home, Anson B. Nixon Park, Adult Care of Chester County, Kennett Senior Center, and Mission Santa Maria. The district also held a food drive supporting the Kennett Food Cupboard with some friendly competition between Unionville Chadds-Ford School District Superintendent, Dr. John Sanville, and Kennett Consolidated School District Superintendent, Dr. Barry Tomasetti. Both districts were vying to donate the most food to the needy. Judging by the turnout of today’s service opportunities, everyone was a winner.